Here are some typical formats that organizers have put together. Ultimately, you are engaging me to provide some training, so we have the flexibility to determine what can meet your needs. The basic format is a seminar, using continuously updated material, and displayed via projectors. Break out discussions are utilized in many workshops to help you develop an appropriate plan for your ministry context. Participants receive copies of the slides with room to make notes in the margins. Some events will include a prayer ministry time in partnership with the local pastor that is hosting the event. This is usually in coordination with retreats or multi-day events. When I visit your city, I am available for additional meeting with committees and various subgroups. I can help you put together a list. One day events are simply an 8 hour event with breaks. The host provides a lunch, possibly passing the cost to the participants. Some will provide a continental breakfast. This can be split into an evening session, with the balance the next day. Some denominational governing bodies will host a workshop on one side of the region, and then the same workshop on the other side of the region. Same program two days in two different place and spend a third day with the presbytery leadership. Back to back weekend events on two different sides of the Presbytery during the same visit, with special group meetings during the down time in between. Perhaps you are organizing a training conference over several days. You can use me as a workshop leader over several days and touch upon many different themes. A 3 day training event with multiple workshop choices available each day during each teaching block. You might have me give teach 3-4 blocks one day on one topic, 3-4 blocks another. Discounts available for same group multiple day events. Sometimes, it more effective to simply make a weekend event out of the whole ordeal. Friday: Meet with committees and special ministry groups. You determine who. Saturday: One day long seminar, open to the public. Saturday night: Special event that evening. 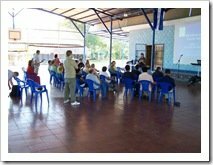 Can be evangelistic meeting or further training. Sunday: Preach at a local church or service (not necessarily your church if that is not your practice). Friday: luncheon with area pastors group. Friday afternoon: specialized meeting with church hospitality team. Friday night: specialized meeting with church’s leadership / outreach team. Saturday night: Youth Evangelism training. Sunday: preach at services and receive love offering for our international work. The cost for a weekend event varies slightly, depending on how you use me on Sunday.